If you haven’t made the switch over to a digital video recorder or DVR you’re missing out on a world of wonder. Clearly, nobody is selling VHS tapes anymore. The digital video recorder is pretty much stand now with any new cable or satellite upgrade. The DVR allows you to pause a program when watching it live, go make a sandwich or take the dog for a walk and come back and pick up right where you left off. You can also program to record the entire season of your favorite shows with a press of a button. All of your shows will be stored on a hard drive with easy access. Once you’ve gone DVR there will be no going back! Even if you’re already a DVR user there are some great tricks of the trade which can help you get the most bang for your buck. Right now, you have the option to record a standard definition (SD) or high definition (HD). Obviously, you’re TV needs to be HD and you need to pay for the extra service but when it comes to recording, HD takes up a lot of space on the hard drive. Certain shows are going to look better in HD but choose wisely so you can make room for everything you want to record. Because DVRs are so easy to use they are also easy to forget about when it comes to deleting. Make sure as soon as you’re done with a show you zap it off your hard drive. If there is a show you want to keep for later, change the save settings to “wait until I erase” otherwise it might get bumped off by your machine. If you really feel the need for additional space, you can always plug in an external hard drive to boost up your storage capacity. A single terabyte can provide you with 140 extra hours of HD and a whooping 1,000 hours of SD storage. Much like getting a good night’s sleep is dependent on the quality of your mattress, enjoying premium HD recordings will depend on the quality of your television. If you’re watching shows on an old overgrown tube set then it’s time for a replacement. Because televisions are considered e-waste, there are laws on the books preventing you from leaving them out on the curb with the rest of the garbage. If you do that you could be fine because it won’t get picked up. To get rid of any of your e-waste or other bulky items you’ll need to make a call to Junk King Pittsburgh. These are the junk removal specialists that provide two capable movers and a huge truck for every job. 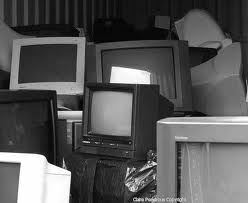 Start with getting rid of your old TV and end up clearing your entire home of junk. That’s the Junk King way! This entry was posted in Junk King Pittsburgh, Pittsburgh Appliance Disposal, Pittsburgh Junk Removal, Pittsburgh TV Disposal and tagged Get Rid of TV, Pittsburgh Old TV Disposal, Pittsburgh Television Disposal, Pittsburgh TV Removal on March 29, 2013 by Ed Stripay. Last updated August 1, 2017 .